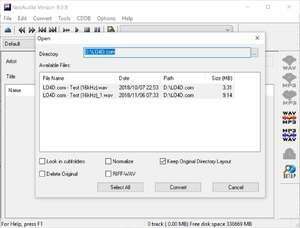 NeoAudio is a free program that rips CD audio to WAV, MP3, OGG Vorbis, or Windows Media Audio (*.WMA) directly. NeoAudio also encodes and decodes MP3s, OGGs, WMAs, and more. Remote and local CDDB and ID3v2 file naming is supported during extraction for automatic track naming. For security reasons, you should also check out the NeoAudio download at LO4D.com which includes virus and malware tests. Additional screenshots of this application download may be available, too. NeoAudio has a presence on social networks. NeoAudio download been highly rated by our users.